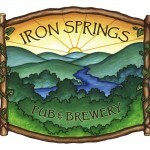 Join us on August 27th at Iron Springs Pub & Brewery in Fairfax for “Give Back Tuesday”. Just bring your family for food & drinks from 4 pm onward and Iron Springs will generously donate back 10% of the tab to support Youth in Arts programs! No coupon necessary, just come and dine out for a great cause!